this film will cause mass enlightenment. It's not many film productions that consult with NASA as they're shooting. But then, not many film productions have Terrence Malick for a director. As cinematographer Emanuel "Chivo" Lubezki tells it, the shoot for Malick's coming-of-age epic "The Tree of Life," starring Sean Penn and Brad Pitt, pretty much made up its own rules as it went along. Then it broke those too. "Once you think you got the formula, you realized there is no formula," Chivo told 24 Frames in an interview. "It's like no set I ever worked on." There are plenty of reasons why that's true. Besides the NASA factor -- Malick consulted with the space agency for footage of the cosmos and other grand imagery he used in the film -- there was the fact that he didn't shoot actors in a conventional way. Or, sometimes, at all. Though most movies use what's known as "coverage" -- cameras stationed in different places, with the idea of conveying a scene as you might experience it in real life -- "Tree of Life" eschewed those conventions. "So the actors are performing the dialogue, but Terry isn't interested in dialogue. So they're talking, and we're shooting a reflection or we're shooting the wind or we're shooting the frame of the window, and then we finally pan to them when they finish the dialogue," Chivo recalled. The movie, which comes out in May, aims to tell of a spiritual journey using a sense of place, a long span of time and a set of striking elemental images -- and, oh yes, also is partly based on Malick's own life. The idea, say those who worked on it, was not so much to tell a story but to create a feeling. And how did the performers react to all this unconventionality -- like, say, the fact that Malick wasn't always interested in what they had to say? "I think they thought we were insane," Chivo said. "Sean is a director, and I'm sure he wondered 'Is this method something I want to learn or is it something I never want to repeat?' For Brad I think it took him a couple of days or a week to get into the spirit." Dede Gardner, Pitt's producing partner and a producer on the film, said a sense of elastic possibility is essential in making a movie like this as well as watching it. "One of the things you learn when you work with Terry is there isn't one interpretation," she said. "Life's experience is individualized, so why shouldn't a film be?" Stetson Mouser turns 3 on Feb. 23, which gives a good idea of how long Terrence Malick's "The Tree of Life," starring Brad Pitt and Sean Penn, has been in post-production. Stetson was a mere 4 days old when he pulled an eight-hour shift on the film, which opens in May. That's his foot on the film's advance poster. "The movie is one of my ‘likes' on Facebook," said mother Heather Mouser, "so you can imagine how excited I was when they showed the poster and I saw my son's foot." It's not yet known if the current poster will be the official one when the movie opens May 27. Stetson got the gig, which paid $75 for the day, when Mouser answered a casting call in Smithville for pregnant women. "The movie people asked me to give them a call when the baby was born," said Mouser, a stay-at-home mom whose husband is an electrician supervisor for JMEG. The couple also has an 8-year-old daughter, Chesney. Mouser met Brad Pitt on the set during the filming and recalled she wasn't starstruck in the least. "He was just a nice, normal guy," she said. "I was just so enamored with my new son, I didn't really focus on anyone else." "The Tree of Life" centers on the lives of three brothers, their father (Pitt) and mother (Jessica Chastain). Stetson Mouser portrays one of the brothers, perhaps Sean Penn's character, as a newborn baby. is that an onion article? i don't know anymore. No, it's real... I thought it was funny though, that's why I posted it. The visual effects team behind Terrence Malick's long-awaited cinematic return talk exclusively to LWLies about the making of the film. 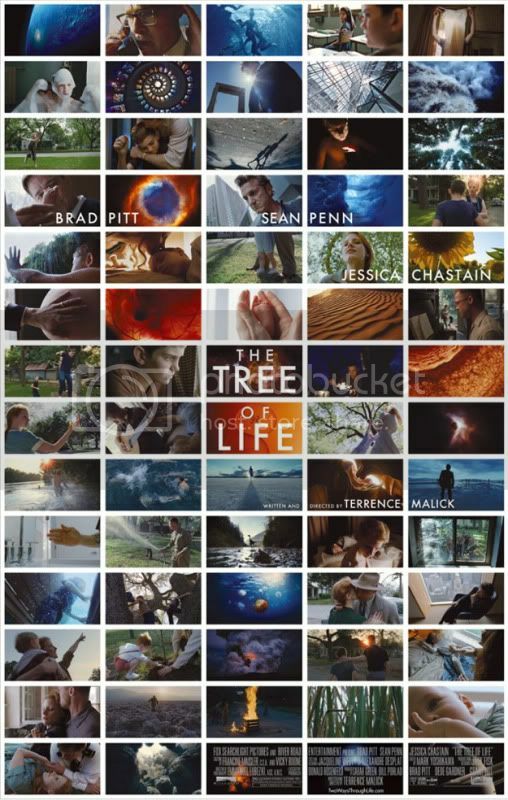 Considered by many to be an enigma because of his reclusive nature and the long gaps between his films, American director Terrence Malick returns to the big screen this year with The Tree of Life. Partly autobiographical, the story revolves around a boy growing up in the 1950s American Midwest whose relationship with his strict father and nurturing mother haunts him into adulthood. Starring Brad Pitt, Sean Penn, Jessica Chastain, Joanna Going, Jackson Hurst, Fiona Shaw, Crystal Mantecon, and Tamara Jolaine, the drama ignited worldwide curiosity when word came out that it included footage involving the formation of the universe. Could this be the resurrection of the mysterious Project Q that was supposed to explore the origins of life on earth? Given the responsibility of creating the nonexistent imagery was visual effects supervisor Dan Glass, who has worked with the likes of Christopher Nolan on Batman Begins and The Wachowski Brothers on The Matrix Reloaded, and who spoke to LWLies about his involvement in the film. One of the big differences on The Tree of Life was the source material, as Glass explains. “The script, if you can call it that, was really more like a set of notes that he has written and built up over some 35 years. He has been working on this project since the ’70s. And we actually have negatives that he shot in the 1970s that we incorporated into the movie. So it really becomes a lifting of notes and ideas. From here a plan was implemented to delegate the visual effects workload. “The material was divided into four broad categories we termed Realms: Double Negative in London handled the majority of the Astrophysical Realm led by supervisor Paul Riddle, journalist Michael Benson consulted and provided extraordinary source imagery from actual probes and telescopes. He and a colleague initially selected and stitched the images together, cleaned them up, and created huge resolution images of 30,000 pixels which we then broke into layers and dimensionalised over very slow exploratory camera moves. For the Microbial Realm we hired a small London boutique company called One of Us headed by Tom Debenham and Dominic Parker that do beautiful work; they have their own little studio where they shoot practical pieces and elements and combine them with very photographic looking CG. Hirota goes on to say, “Terrence Malick is notoriously secretive… I don’t know much about this movie. I don’t really know how the work fits in.” This comes as no surprise to Glass. “I would sometimes deliberately misguide the intention,” he admits. “An animator would want to know, ‘What’s the purpose here? What’s my motivation?’ So I would deliberately misguide a little and push in one direction and say, ‘Now adjust it and do this,’ just to try to get that zone where you have a little bit more of an ambiguity and something that’s more animal than human in its characteristics. Bryan Hirota observes, “Malick, it seems to me, needs to see stuff, and then brings his film to life in the editorial process; it’s not necessarily clear to him exactly where his film is going to take him. It’s like a process of discovery for him.” Informed of Hirota’s comment, Glass responded, “With Terrence… his vision is strong. He knows where he’s going but because his goal is much more esoteric, it’s less tied down to any literal representation. That’s why the editorial process is critical to him, even with his live action; he shoots a lot of footage that can play in many different contexts, and some of his favourite moments are things where they’ve yelled, ‘Cut!’ and the actors almost break character. Those are the pieces he’ll love. Similarly, in the visual effects…you’re working for days, weeks, sometimes months trying to make something so precise. And yet for Terry that could work against the very organic nature of the material so we had to spend more time to free it from itself. I don't know if they're stunning, but I'll be damned if they're not images. As widely expected and to no one's surprise, it has been confirmed that Terrence Malick's The Tree Of Life will screen at this year's Cannes Film Festival, most likely in an out-of-competition slot in the official selection. The bigger mystery now is whether distributor Fox Searchlight will have screenings stateside before shipping the period drama overseas, given that the film's release date in France (May 18) comes during the festival (May 11-22). Will Searchlight want to give Cannes a true world premiere, or will it want to provide the media with the more standard lead times that screenings in the U.S. would provide? The latter was the path taken by last year's Cannes opener, Ridley Scott's Robin Hood. There has been speculation for a year now about just when and where Tree Of Life, starring Sean Penn and Brad Pitt, might get its premiere. In reality, the French Riviera always has seemed the place for it: The project wasn't ready in time for a Cannes bow last year (though Cannes general delegate Thierry Fremaux saw a cut of the film and agreed to include it in last year's edition, even if the notoriously elusive Malick didn't attend the fest) and since then the usual spots at Telluride, Toronto, Sundance and even South By Southwest (Malick is Texas-based) have come and gone. Tribeca obvioulsy wasn't a big enough springboard, so what really was left for a studio seeking a global platform for an auteur film? Cannes will unveil its official selection next month. Woody Allen's Midnight In Paris already has been slated as the opening-night film. Wow, this is unexpected. With Terrence Malick‘s “The Tree Of Life” pretty much confirmed for the Cannes Film Festival, we figured that it would serve as the global launchpad for the film, however, it turns out that’s not the case. Empire reports that Brit audiences will be the first to get mindfucked by Malick, with “The Tree Of Life” now scheduled for a Wednesday, May 4th release. That’s one week before Cannes kicks off and three and a half weeks before it lands on our shores. We can feel Cannes honcho Thierry Frémaux slightly fuming that his big ticket festival centerpiece will now get a bow elsewhere first. So what does this mean for Cannes and Malick? Well, it almost certainly guarantees that the film will not play in competition (though we never figured it would anyway). However, it does still mean Frémaux will still get the glitzy red carpet with Brad Pitt (likely with Angelina Jolie in tow), Sean Penn, Jessica Chastain and hopefully, the reclusive Malick himself. While it does take some shine off the premiere, there will be a lot to keep the photogs happy and frankly, most of the world press will still be eagerly awaiting to see the movie for the first time. Another unexpected development from a film and director continuing to throw us curveballs. For those of us stateside, “The Tree Of Life” lands on May 27th. It's like the iPad of spoilertars. First thing I thought of was "they stole my avatar." Ha! First thing I thought was "at least Mod won't have to work very hard for his avatar this time". Then I looked down and he's way ahead of me. I can't tell if I think Jessica Chastain is pretty or not. My brain says no, but my ya know what says yes.